I’m consistently drawn to books about sisters, mostly since I have two of my own. We are the Goldens was a bit shorter than I expected, but it was still pretty compelling. Using a second person point of view, liberally sprinkled with recollections in tandem with the present-day confession that runs through the novel, it was a unique read. Readers are introduced to Nell and, through Nell, her sister Layla. These two have been joined at the hip for most of their lives, with Nell pretty much unable to consider herself as an individual separate from Layla. Everything changes when Nell discovers that Layla has been keeping a secret (a secret that is revealed early on, or at least easy to guess early on). It’s a secret that threatens to change everything – the dynamic between them, the situation with their family, friends and even community. The serious nature of the secret is why We are the Goldens exists – Nell is making a full confession to Layla and to everyone else. We are the Goldens is one of those contemporary novels written to capture a particular period in a character’s life. Nell is a character struggling with multiple situations all at once. Her main conflicts revolve around stepping up into her own individual identity (apart from Layla), and about what to do in response to Layla’s secret. Her problems and memories all tangle up together in the tale, revealing Nell’s feelings and rationale behind her choice. It was a very interesting way to tackle this story, to say the least. However, I was not particularly connected to Nell or Layla as individuals. [Fact: My favorite character is actually a secondary one – Felix, Nell’s best friend. He just so happens to be really awesome!] I liked their relationship as sisters a lot though, because it progresses from an extreme closeness to a relationships filled with secrets and the nagging sensation of growing apart. This really felt true to what sister relationships can be like sometimes, so I appreciated that aspect of this book a lot. I also have reservations about the length of this story. While I do understand that the author is trying to capture all the things going through Nell’s mind as she confesses to her sister, I find myself curious about other things. There’s Felix, and the role he’ll continue to play in Nell’s life. There’s Layla’s secret, which I would have liked to learn more about. These two things are the ones I’m mostly curious about, and feel should have been more detailed. In the end, We are the Goldens is like a bunch of photographs in a pile – a set of shots framing Nell and Layla’s present situation. Readers will get a pretty good glimpse into their lives, their relationship, their stories. But it will also leave you wanting just a little bit more, too. What do you think about books written in the second person POV? Honestly, I don't think I've read very many of them! I'm having a hard time wracking my brain to think of other examples, though I'm sure I've read at least one other title apart from this one. It's a very hard POV to tackle when writing a novel. It feels like a tightrope to me, as the story could either be wind up perfectly balanced, or leaning more towards detachment or too self-involved. I can't form a particularly concrete opinion since I haven't read too many yet, but I can at least say I'm open-minded about trying some more of them. As a special bonus, I'm hosting a giveaway for a copy of We are the Goldens! Please note that it is US ONLY. "In the end, We are the Goldens is like a bunch of photographs in a pile – a set of shots framing Nell and Layla’s present situation. Readers will get a pretty good glimpse into their lives, their relationship, their stories. But it will also leave you wanting just a little bit more, too." ....Has me wanting to read this book. I love the comparison you came up with and am now curious! I don't think I've read a book with a similar subject matter--I'm intrigued. 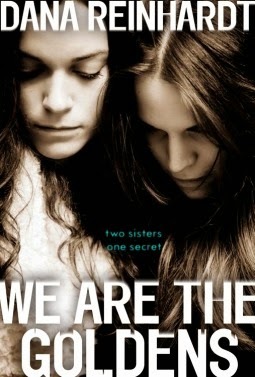 I love to read books about sisters and am very curious to read this one! Um, reason I want to read this? Sisters. As for the question... er... I don't know if I've ever read a book in 2nd person. I'm not even sure if I know what it is. Lemme google... hold on. Okay, so I looked it up. I think it would be okay if done right, but I could see how it might be difficult to get into a story. Interesting concept though! When I first started reading your review, I was interested in this book, but I'm now thinking it's probably not for me. Like, I love the idea of it (though it is hard for me to relate to sister books since I'm an only child), but I wish this story wasn't told in second person. I love that perspective, but not when it's talking about someone else (Idk if that makes sense to you or not). Hmmm. Maybe I'll wait for a few more reviews and then see.